Unable to upload files to HQMS larger than 200 KB. Windows Server 2003 by default limits upload sizes to 200 KB for ASP pages. 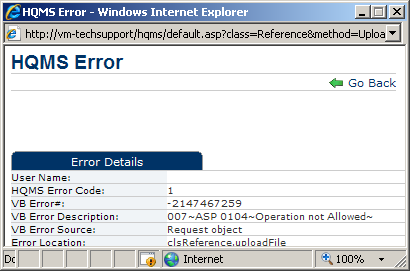 IIS 6.0 (Windows Server 2003) has a file named metabase.xml which resides in the C:\Windows\system32\inetsrv folder. Navigate to that directory and edit the file in Notepad. Search for an entry called AspMaxRequestEntityAllowed. This defaults to a value of 204800, which causes IIS 6.0 to limit allowed upload size to 204,800 bytes (1 kb = 1,024 bytes : 1 mb = 1,048,576 bytes). Changing this value to a larger number will allow the Windows server to accept larger uploads. If your server does not allow the Metabase Edit-While-Running feature, you will need to stop the IIS service before you can save the metabase.xml file. Note: There is another entry call AspBufferingLimit which limits the size of the files users can download. You must increase the value of this field to match or exceed the upload entry so that users can download the files that are uploaded.